The foreign media image of President Recep Tayyip Erdoğan and the Turkish government has shattered over the past 18 months, and in response Turkey has ramped up an international information blitzkrieg. The tone is becoming increasingly bitter, motivated by a conviction that the foreign media is a propaganda weapon deployed by the West to attack the ruling Justice and Development Party (AKP). Patriotic Turks are called on to rally behind their government in the name of national sovereignty. This sense of embattled defiance is important to understand, and reveals much about the resentful mindset gripping the state. Suspicion about the foreign press is hardly new in Turkey, but it’s unfortunate to see the worst of such sentiments returning – openly sponsored by Erdoğan and the AKP’s top brass. The president himself is even managing to turn international criticism to his own advantage, as evidence that the West is implacably hostile to Turkey and its fearless, truth-telling leader — a useful populist line ahead of next June’s crucial parliamentary elections. An increasingly narrow coterie of trusted media figures is being granted access to the prime minister. The effect isn’t only seen in who Erdoğan accepts onto his plane; it is also there in the TV stations and newspapers that he and other prominent government figures choose to grant interviews to, and in the hand-picking of interlocutors during these exchanges. Of course, democratic governments across the world have media groups to which they are closer and which, to some extent, they rely on; indeed, the opposition parties in Turkey also have their own “reliable” media camps. But there’s something blatantly unfair about the mutually supportive state-private network that is reinforcing the AKP government in power today. The cosiness of the prime minister and the media accepted onto his jet is just one of the most obvious examples of this favouritism. Last week, the Nielsen Company’s AdEx advertising information report caused quite a stir in Turkey, revealing how advertising provided by state companies was weighted heavily in favour of government-friendly media groups. 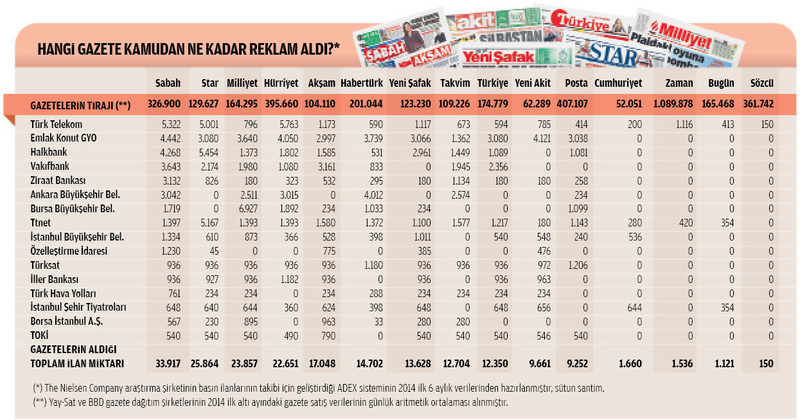 According to the report, of the 18 national newspapers examined, the three that received the most public advertising slots in the first six months of 2014 were the pro-government Sabah, Star and Milliyet dailies. The bottom five, meanwhile, were all broadly AKP sceptics, despite two of them – Posta and Zaman – having the highest circulation figures in the country. The two newspapers known as being close to the movement of ally-turned-bête noir Fethullah Gülen – Bugün and Zaman – received almost zero advertising from state institutions. Similarly, TV stations that are known to be closer to the government received far more advertising from public bodies in the first half of the year. Two pro-Gülen television channels – Samanyolu and Bugün TV – received no advertising revenue whatsoever from state companies. While much of the recent focus has been on public broadcaster TRT’s hugely imbalanced coverage in favour of Erdoğan ahead of next month’s presidential election, the way that state institutions are marching in lock-step with government-friendly private companies also has perilous consequences. 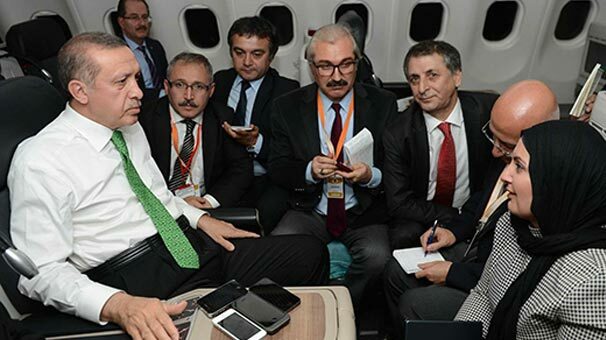 The issue of who gets to travel on the prime minister’s private jet is only one symptom of a Turkish media stuck in a broader partisan malaise. Indeed, while those who get invited onto the PM’s plane see their role as only being to transmit whatever the prime minister says, the myopic fixation on every word uttered by Erdoğan is unfortunately shared across pro- and anti-government outlets (as I have previously written). With important exceptions, all sides are sucked into an endless, meaningless argument about where they stand on whatever Erdoğan’s latest utterances and positions are – those positions are the fuel motoring 80 percent of Turkish media’s shallow news agenda. “Important Statements from the Prime Minister” stories are only becoming more common as power becomes more centralized around one man, and the situation isn’t likely to improve after Erdoğan is elected president next month. Akşam newspaper claims that “Turkish-Europe” lobbies in Germany – including Turkish media tycoon Aydın Doğan – are working in partnership in a slander campaign against the AKP government. How do you assess Prime Minister Erdoğan’s speech in Cologne? From now on, no matter what he does, unfortunately we’ve come to the point where it can’t really change anything … The Soma mine disaster and his earlier speeches have formed such a bad picture. From now on, Erdoğan won’t easily be able to change this image. He’s also negatively affecting Turkey’s image. In recent years here, there was a positive image. But that has completely collapsed, it has reversed and a negative image of Turkey has been formed. Erdoğan has become a symbol of this negative image. Isn’t the German public’s reaction to Erdoğan very exaggerated? Both his supporters and his critics are exaggerating. His supporters completely idolize him, and see him as a completely faultless, flawless person; while a section of his critics are making a big mistake by comparing him to Hitler. The comparison with Vladimir Putin is better because Erdoğan really is transforming Turkey into an authoritarian regime. But the Hitler comparison is very excessive. So, without generalizing, both sides are making mistakes. These exaggerated approaches are having a very negative effect on the perception of Turkey here in Germany. In Erdoğan’s speech, Angela Merkel was booed in the hall. This booing of Merkel’s name leaves a very bad impression. It was very ugly, and it will stay in people’s minds. We will be the ones to pay the price for this. It gives the message: You’re living here, you’re eating its bread, your taxes are paid here, your children are going to school here, you’re benefiting from the welfare state. At the same time, you are booing this country’s prime minister and worshipping another country’s prime minister. It brings the question of loyalty back onto the agenda. We have been struggling for 50 years. “We are loyal citizens,” we say. “Trust us, there’s no need to worry.” This is brought down by the image left by those who went to that rally. Erdoğan actually had a lot of different groups booed in the rally. The crowd was transformed as if it was living on enemy soil. There is no such partisanship in German politics; they support politicians but they don’t worship. In the end we are just people; all of us will depart this world one day. To worship someone in such a way both amazes and scares people. In addition, those German Turks who were demonstrating against Erdoğan’s visit pumped up fears about whether “Turkey’s internal problems are being brought here.” In the past there was polarisation between Turk and Kurd, right and left; now the worry is spreading about whether the new polarisation is between Erdoğan’s supporters and his opponents. Erdoğan’s image in Europe was very positive for many years. How is it now after this speech? He’s destroying his own successes. As a Turkish-origin politician, what do you say to the German public? In the past, we used to say things like, “Probably he meant to say this; if he knew the details he would have spoken differently.” But we’ve gone beyond that, there’s nothing we can defend anymore. Even those ministers in Germany who were previously most positive [about Turkey] are now saying, “This is more than enough.” Erdoğan has 100 percent lost Germany. It’s extremely sad to see how quickly the tragic Soma mining disaster has become the latest material to be used in Turkey’s political turf war. Soon after news of the country’s worst ever industrial disaster broke I was appalled by the immediate politicising of the incident; perhaps naively I thought that the time for recriminations could follow after a period of respectful mourning for the hundreds of dead miners. However, events quickly took on a momentum of their own; it became hard to talk about “not politicising” the tragedy after the prime minister and his entourage attacked grieving and angry locals in the town, and when there is such a shocking lack of accountability from either the mining company or the government. A heavy burden of responsibility for this lack of accountability falls on the shoulders of Turkey’s supplicant mainstream media. There is plenty of talk of “yes men” in Prime Minister Recep Tayyip Erdoğan’s inner circle, but Turkey’s entire mainstream news media acts in a similar way. Watching the major TV “news” stations – ATV, NTV, 24TV, CNN Türk, Habertürk – in the aftermath of the disaster has been depressing and infuriating: A procession of ministers giving statements, interviewers desperately trying to avoid asking difficult questions, and a complete unwillingness to report many of the most significant incidents that happen. Why the lack of numbers of those still inside the mine three days after the explosion? Why the lack of exact numbers of those who went down into the mine in the first place? Why the confusion over the cause of the disaster three days later? Why the confusion over the official death toll? Why did it take three days to get any official statement from the mine’s owner, Soma Holding? Why no resignations? 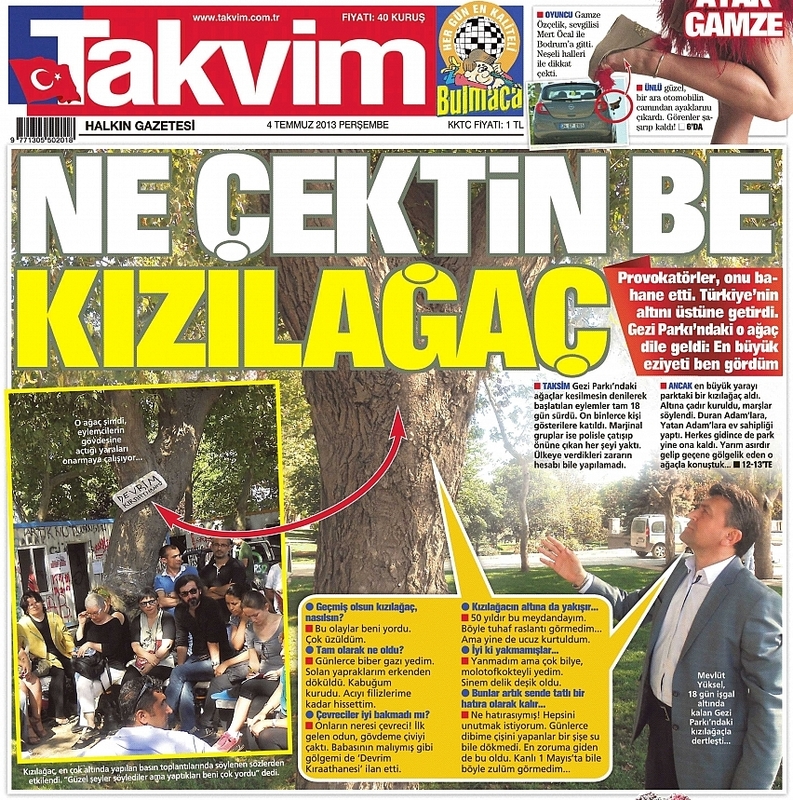 Erdoğan’s disastrous May 14 visit to the town – during which he delivered a shockingly insensitive speech, was heckled by the crowds, and then attacked grieving protesters along with one of his advisers – was also shamelessly covered up by all major TV stations. This was particularly ironic, as they are usually so keen to slavishly report every single word that comes out of the prime minister’s mouth. PM Erdoğan snapped while reading Yeni Şafak recently. But Erdoğan’s apparent lack of sympathy doesn’t just come from nowhere; indeed, his dreadful response to the tragedy has been conditioned by his “yes man” media, which is often little more than an echo chamber of his own words. When the PM never has to respond to a tough question, gives “interviews” with genuflecting, hand-picked interviewers, and holds stage-managed televised rallies in front of hundreds of thousands of bussed in supporters, how will he respond when faced with spontaneous grass-roots opposition holding him to account? When the Justice and Development Party (AKP) government is surrounded by a media establishment simply reinforcing its narrative on every single issue, it isn’t surprising to see it respond with anger and confusion when confronted by events beyond its control. The Turkish media is flawed because it doesn’t inform the public properly. But its soft-touch failure to hold the ruling authorities to account is actually harming Prime Minister Erdoğan in a more subtle way. Such pandering has made him sloppy, complacent, and blinkered, so that when a “black swan” event like the disaster in Soma occurs, he is simply not conditioned to respond adequately. One of the less recognised effects of the AKP’s castrating of the mainstream media is to make it less responsive to such incidents. Ultimately, while they may seem to help the government in the short term, the AKP’s echo chambers have actually isolated Erdoğan, damaging his ability to think and reason clearly, and contributing to his utter inability to sympathise with those who aren’t like him. The Soma disaster is only the latest example of this; it’s certainly the saddest.